Of course, pretzels have carbs, but carbs are not evil in moderation! Actually, I made this again with three large sticks and thought it was better than two but you can see what works for you. I was originally going to add peanuts, but decided I didn't need the extra calories and fat for this recipe. To cut calories in this recipe you can add unsweetened almond milk and use an artificial sweetener like stevia, or you can cut the milk altogether and just use water/ice. You can also substitute for fat free cottage cheese or tofu, and cut it down to about 220 calories! Adding a bit of 72%-80% dark chocolate blended or crushed on the top would also be a great way to add some low fat, low calorie indulgence to the recipe. 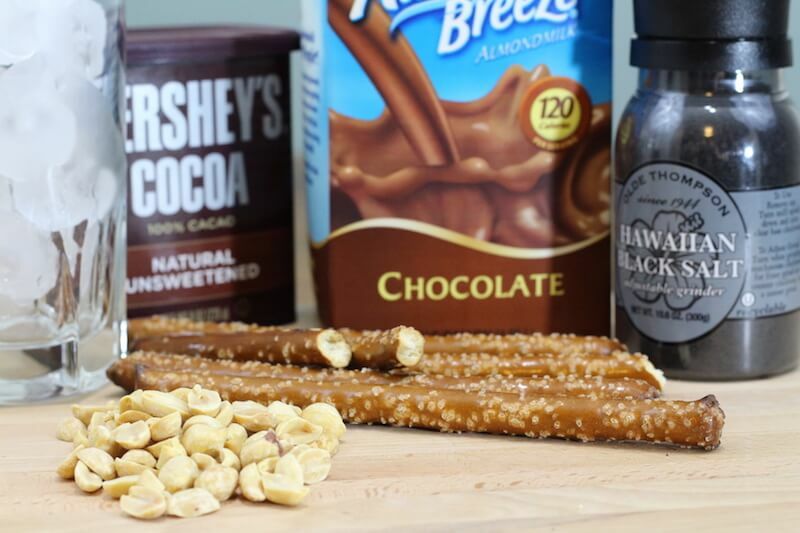 Oh, and as mentioned above, this recipe was inspired by the Snickers Protein Shake and the Snickers Pretzel Milkshake.